(i) S-Type: A planet orbits one of the two stars. 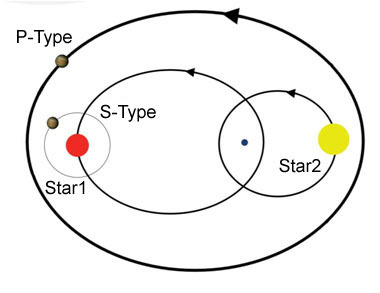 (ii) P-Type: A planet stays in an orbit around both stars. 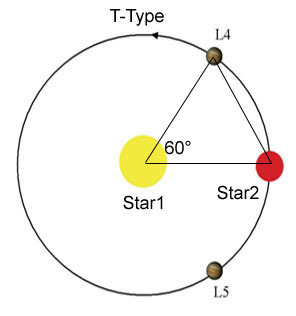 (iii) T-Type: A planet may orbit close to one of the equilibrium points L4 and L5. This project is dedicated to the dynamics and the theory of observations of planets in S- and T-Type configurations in binary star systems. We will do these investigations with the aid of extensive numerical integrations. With the help of stability studies, we want to understand the role of mean motion resonances and secondary resonances in transit timing of eclipsing binaries. In addition, we want to identify regions in the orbital parameter space where extrasolar planets can have stable orbits. In a further step, we will concentrate on the discovery of planets in S- and P-Type motion. This will be realized via investigations of eclipse timing variations (ETV). With the ETVs we will show whether it is possible to detect planet induced perturbations in the transit signal of the secondary star. The results of this project can serve as a guideline for actual and future observations - especially satellite missions – and will improve our understanding of the architecture of extrasolar planets in binary systems.